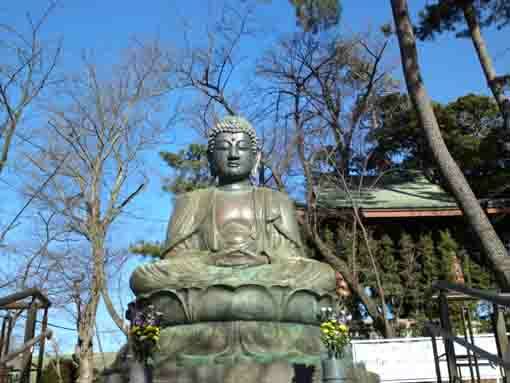 The Great Buddha in Hokekyo-ji, the statue of the seated Shaka-Nyorai, shows the figure of Buddha becoming enlightment. 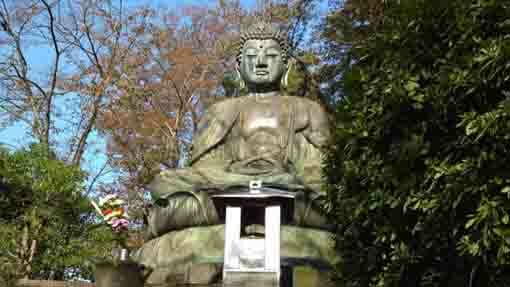 It is the largest Daibutsu in Chiba prefecture. It is told that its height is jo-roku, so the height is 356 cm and the width is 279.5cm. 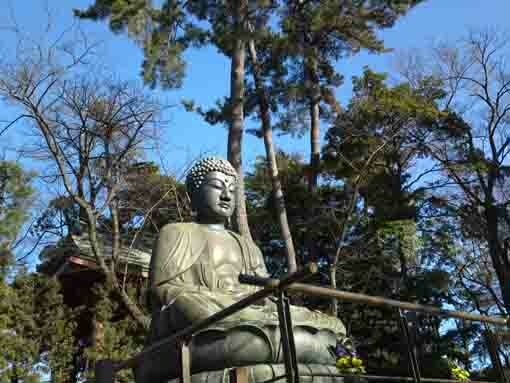 The Daibutsu has gentle expression on its face. It expresses to visitors that Buddha has gentle mind to help them. Nichizen, the twenty-eighth abbot of the head temple Honpo-ji Temple in Kyoto succeeded the fifty-ninthe abbot Nakayama of Hokekyo-ji Temple in 1717, enthusiastically propagate Nichiren Sect teaching to people and collected donations to construct a Daibutsu in Nakayama Hokekyo-ji Temple He asked Masayoshi Fujiwara of Ota-Suruga-no-kami living in Nabe-cho, Kanda, Edo (Tokyo) to construct it, and the construction was accomplished in September 1719. Nakayama Daibutsu was constructed to pray for peace, good harvest, happiness and flourishing Nichiren Sect, these wishes are carved on its lower back. Now Nakayama Daibutsu was repaired in 2018 and it could stand forever. Honpou-ji Temple was bulit by the venerable Nisshin of Kuonsaiin at Ayanokoji, Higashitoin,Kyoto in 1436. The venerable Nisshin presented his masterpiece 'Risshochikokuron' to Yoshinori Ashikaga, the sixth Shogun of Muromachi Shogunate to resort to a petition of the peace to him directly. However this offended Yoshinori's sensibilities, he was put into a jail and his temple was fired. In addition, the punishment that the Shogun Yoshinori inflicted on Nisshin gradually became severe, they were so cruel that nobody could not watch. One day he put a baked pan on his head. This incident gave him 'Nabekaguri Nisshin-jonin' (the venerable Nisshin with a pan). Although he suffered several inhuman persecutions, his missionary work continued enthusiastically. Finally, the Emperor, Gohanazono was interested in him and gave him a land at Shijotakakura, then he rebuilt his temple there in 1455. In 1460, it moved to Sanjomadenokoji, then it moved to near the Ichijo-Modori-bashi bridge (Now there is Seimei-jinja Shrine) in Tenppo Ages. 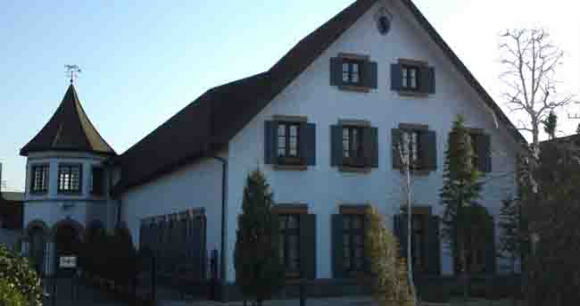 In 1587,　it fainally moved to the present site due to the land planning. 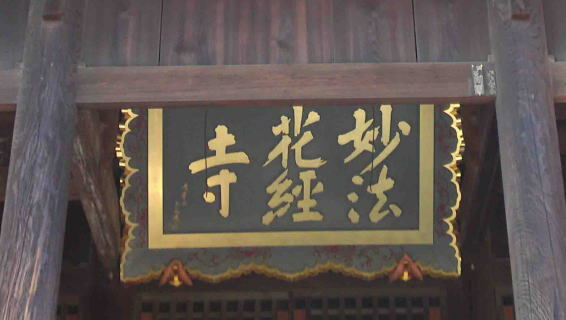 At that time, the tenth abbot of the venerable Nichitsu was given a thousand koku (1koku is 157 kg of rice; it meant that 1 koku could be harvest a land), and the father of Koetsu Honami, Koji rebuilt the buildings in the temple, they stood on magnificently and they became the credits to believers of NIchiren sect. 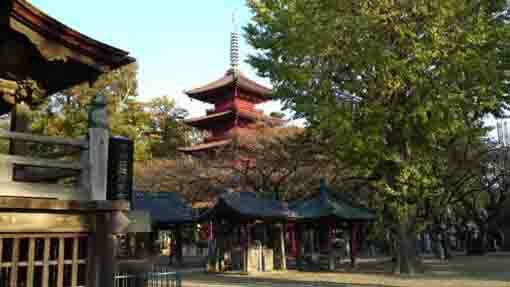 The buildings now in the site has been rebuilt by the believers of Honpouji Temple after it had got fired in 1788. Masayosi Hujiwara was a famous caster lived in Kandanabecho (Tokyo). He worked actively from Hoei Ages to Kyoho Ages (the first half of 18th century). Edo-roku-jizo (the six Jizo in Edo) ordered by Shogen Jizobo in Fukagawa (Tokyo) and Suiban (a basin) in Tomioka Hachimangu in Fukagawa are famous. The Six Seated Statues of Jizo were constructed at the six gateways of Edo (the old name of Tokyo) in 1706 by the order by Shogen Jizobo in Fukagawa Edo with much donations by thousands people in Edo. While Shogen had prayed for recovery his diseases, he became well, then he ordered to construct the Jizos like Kyoto Roku Jizos (the six Jizos in Kyoto). The caster, Fujiwara Masayoshi of Ota Suruga-no-kami in Kandanabe-cho constructed them. Their heights are about 270cm. First , they were guild with gold (The second Jizo in Tozen-ji Temple　was coated by Bengal), there are few marks on them. And there were some small seated statues of jizo and lists of the contributors in each Jizo. And also there are carved names on them and on their lotus pedestal, so the total of them were over 72,000. 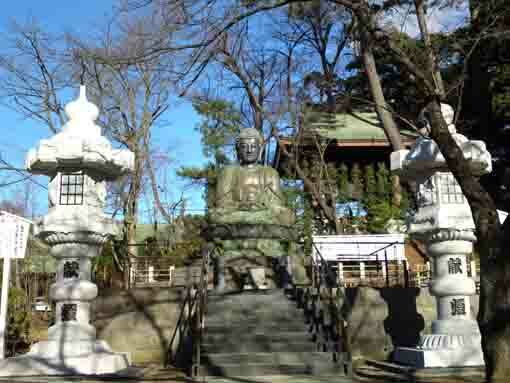 Edo Roku Jizos stands in the six temples; Shinagawa-ji in Sinagawa, Tozen-ji in Asakusa, Taiso-ji in Shinjyuku, Sinsho-ji in Sugamo, Reigan-ji in Sirakawa and Eitai-ji in Tomioka (The Jizo in Eitai-ji was stood near the second Torii in Tomioka-hachimangu, but Eitai-ji was ruined due to the anti-Buddhist movement in Meiji era 1868, so the Jizo was disappeared). Now the five Jizo of the six are designated by Tokyo Metropolitan Government as the tangible cultural properties. The venerable Nisshin was a priest belonged to Nichiren Sect, he was famous for the name of Nabekaburi-Nisshin. After missionary woks in Kyoto, he went to Kyushu. 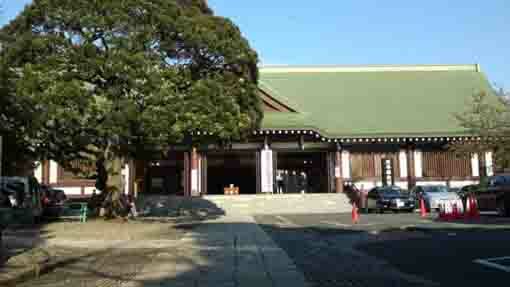 He taught the members in the sect at Kosho-ji Temple in Matsuo, Ogi, Hizen-no-kuni (Ogi city in Saga Prefecture). Since then, the superior in the temple had held the superior (the abbot ) of Nakayama Hokekyo-ji Temple, but this time he got the post, and he became the first abbot of Kosho-ji Temple, and he contributed to development of Nichiren Sect at Hizen in Kyushu. In Saga prefecture, so there are not only Kosho-ji Temple but also many temples that Nisshin had built, and converted from other sects to Nichren Sect, so there are so many historic associations of him. Although Nisshin expressed strong faith along Nichiren Sect and he severely criticized the lord the Chiba Clan, he was excommunicated in 1437 and he leaved Kyushu. In the next year, he appeared in Kyoto again, he expressed a petition to the sixth Shogun Yoshinori Ashikaga to believe in Nichiren Sect and to forsake his faith in other sects, but Yoshinori had never turned to for him. Then he wrote 'Risshochikokuron' to try petitioning the Shogun again. While he was writing it, he was put in jail. He had got several cruel punishments in the jail. A punishment that he was put a baked pan on his head to be given up him, but he did not give up his faith. This incident was very famous, then he would be called 'Nabekaburi Nisshin' (Nisshin with a baked pan on his head) Next year of 1441, he was freed by amnesty due to Kakitsu-no-ran (Kakitsu Incidents) that the Shogun Yoshinori was assassinated by his fellow Mitsusuke Akamatsu. 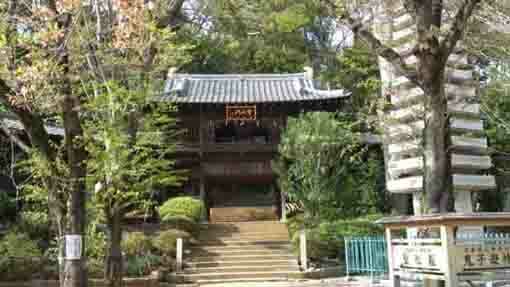 After that, Nisshin built Honpouji Temple in Kyoto as his base to engage missionary work throughout Japan. However he suffered persecutions everywhere he had gone to since he demanded for people to believe only the words of the founder Nichiren severely and he also attacked to the other Buddhism sects. In 1462, the government of Muromachi Shogunate put Nisshin in jail again as a punishment for him because of his strong mission. Next August, he was freed by amnesty again. Since then, he seldom travel to propagate, he worked on restructuring his believers at his base Honpouji Temple in Kyoto. The venerate Nisshin passed away in 1488, he finished his missionary work through his life of 82 years. Yoshinori Ashikaga was the sixth shogun of the Muromachi Bakufu (Muromachi Shogunate). His father was the third shogun Yoshimitsu, and his mother was Yoshimitsu's concubine, Keiko Fujiwara. In 1403, he was put into the Buddhist priesthood at Shorenin in Kyoto, he named Gien. In November 3rd of 1419, he became the Tendaizasu ( the chief abbot of Tendai Sect) . His elder brother, the fourth Shogun Yoshimochi had lived longer than his son the fifth shogun Yoshikazu, therefore when his elder brother died, there was no successors. In January 17th of 1428, the senior statemen of the shogun held a conference who should be the sixth shogun, then they adopted a lottery, and they decided Gien by the lottery in front of Iwashimizu Hachimangu in Kyoto.the shogun. Next day of January 18th, Yoshimochi passed, he went out of Shorenin to succeed the post of the sixth Shogun. Therefore he was called ‘Kuji Shogun’( the shogun of the lottery). He was appointed the Jugoinoge (Junior Fifth Rank, Lower Grade) the Samanokami (the head of the section taking care of imperial horses) in March, and he changed his name Gien to Yoshinobu, then he cerebrated his attainment of manhood. In March 15th, he became Sangi (Councilor), Sakone-no-Chujo (lieutenant general of the left), and he was appointed Shogun, then he changed his name Yoshinori. March 29th, he promoted to Jusanmi (Junior Third Grade) Gon-no-Dainagon (the chief councilor). In November 13th, he was in Junii (Junior Second Grade). In October 17th of 1429, he reached at Juichii (Junior First Grade). Moreover, he was the Nidaijin (the minister of the center) in July 25th, Sadaijin (the minister of left) in August 28th, Denjyo-betto (the supervisor of all members serve at the Imperial Palace) and Ujichoja (the chief of all clans in Japan) in December 9th. He was very strong, so he tried to build up the authority of the Muromachi Bakuhu and the power of Shogun. In 1439, he ruined Kamakura Kubo (Kamakura Shogun) in Sagami-no-kuni (Kanagawa Prefecture)Mochuji Ashikaga who tried to build an independent authority from the Bakufu in Kanto (Eikyo-no-Ran; the Eikyo War). He attacked to Yoshitsura Isshiki and Mochiyori Toki in 1440. And he forced priests in Kofuku-ji and Eizan to submit by his military power. They had excitingly strengthened the authority. However, his attempt was so severe that his retainers had complaints and fear in their mind. In June 24th of 1441, Mitsusuke Akamatsu who was his important retainer held the party to celebrate of the victory of the battle at Yuki at his mansion, and he invited Yoshinor ito the party to kill him(Kakkitsu Incident). He was assassinated at last. June 29th, he was appointed Daijyo-Daijin (the prim minister) for the repose of his soul. He was buried at Tojiin Temple in Kyoto in July 6th. His Buddhist name was Fukodenzenzandoe. 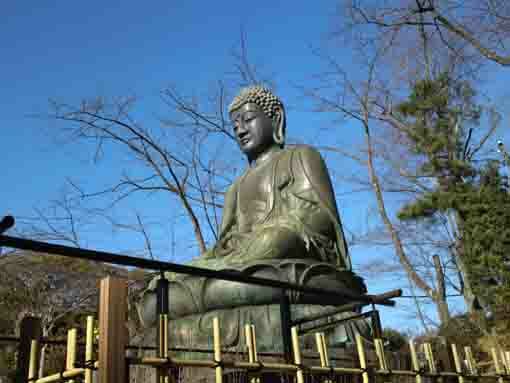 Nakayama Daibutsu (The Great Buddha) in Nakayama Hokekyouji Temple has great accessibilities from both Narita and Haneda International Airport.